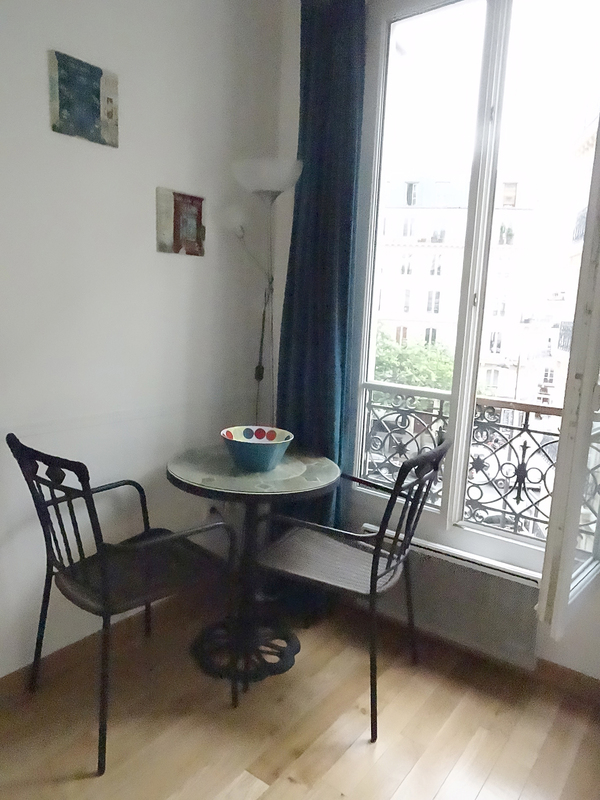 Welcome to the third apartment in my journey as a nomad in Paris. And what a difference a few blocks makes. 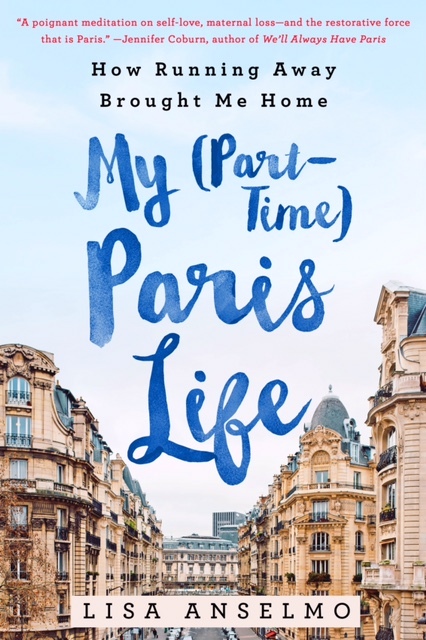 To catch you up, I’m scrounging around Paris for short-term rentals while my own apartment has been rendered unlivable by a leak in the building. If you want to read more about the journey so far, click here. 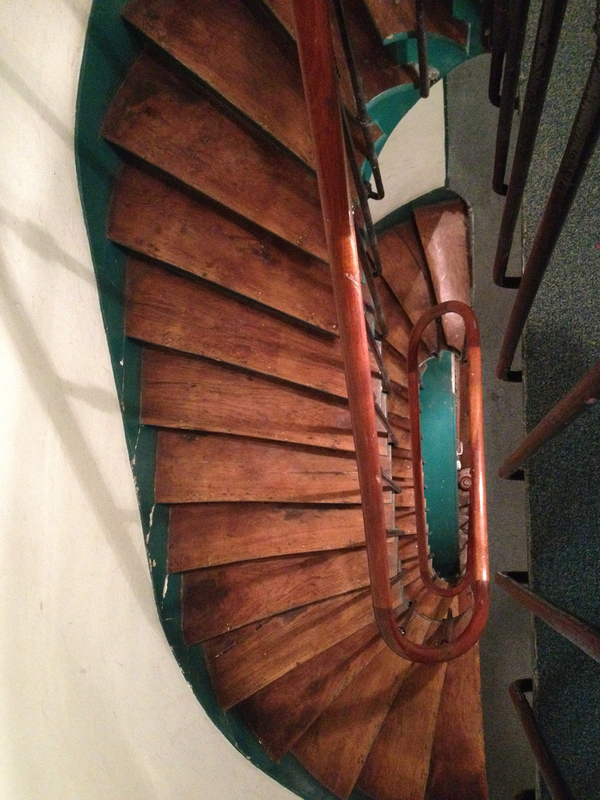 The latest apartment is another 3rd floor walk-up (my gams are shaping up nicely! ), situated in the Oberkampf district of the 11th arrondissement. 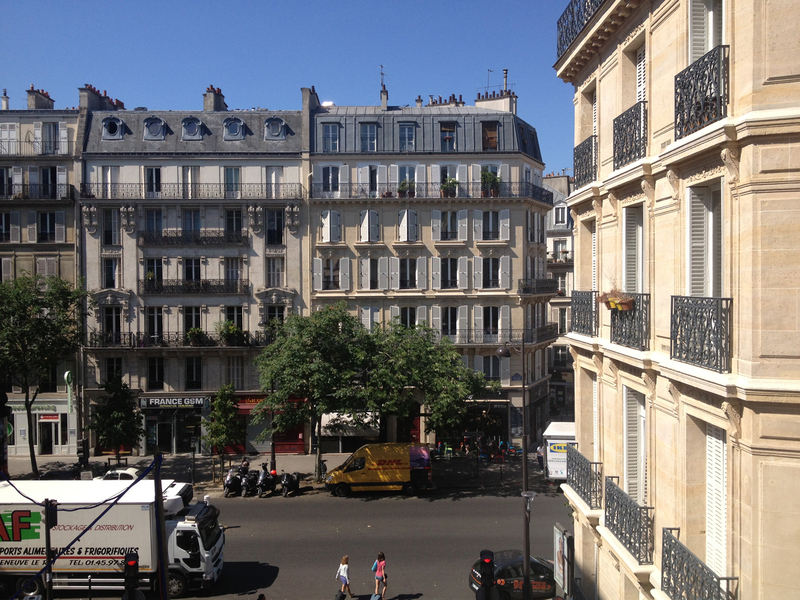 Unlike the last two buildings I’ve stayed in, this one is a little…er…edgier, much like the neighborhood, more reminiscent of an old tenement building in Manhattan’s Lower East Side than Haussmann’s Paris. Well-worn carpeting runs throughout the common areas, and we have an ever-changing display of “street art” in the lobby. 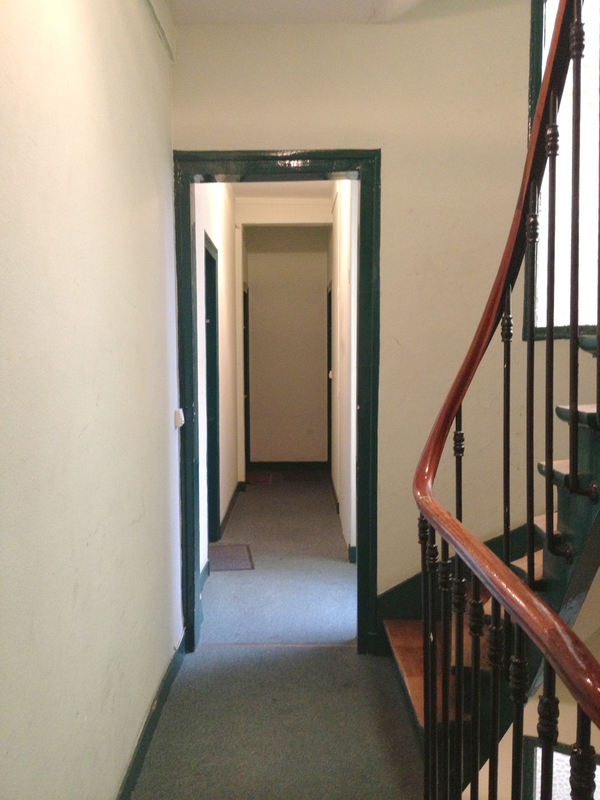 I’m not sure if the artist lives among us, but our hallways are his gallery. This is real urban living. What a contrast to my lovely courtyard studio in the 3rd arrondissement. The apartment, on the other hand, is pristine and sunny—newly renovated, and in spite of its diminutive 23 square meters, or 248 square feet, is totally accommodating with plenty of storage, a fully equipped kitchen including an oven, a huge shower in its windowed bathroom, and a separate bedroom with a desk. 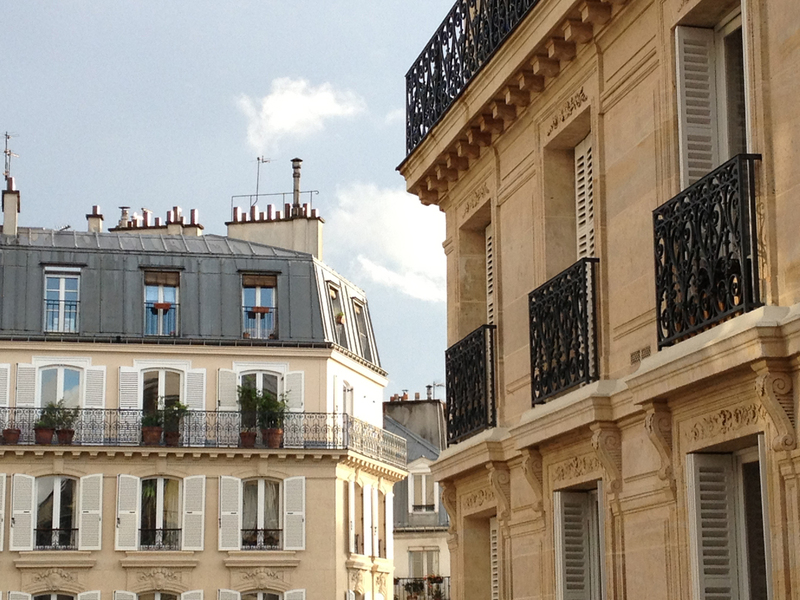 Three large windows provide a classic view of elegant Parisian white stone buildings with their balconies and gray zinc rooftops. 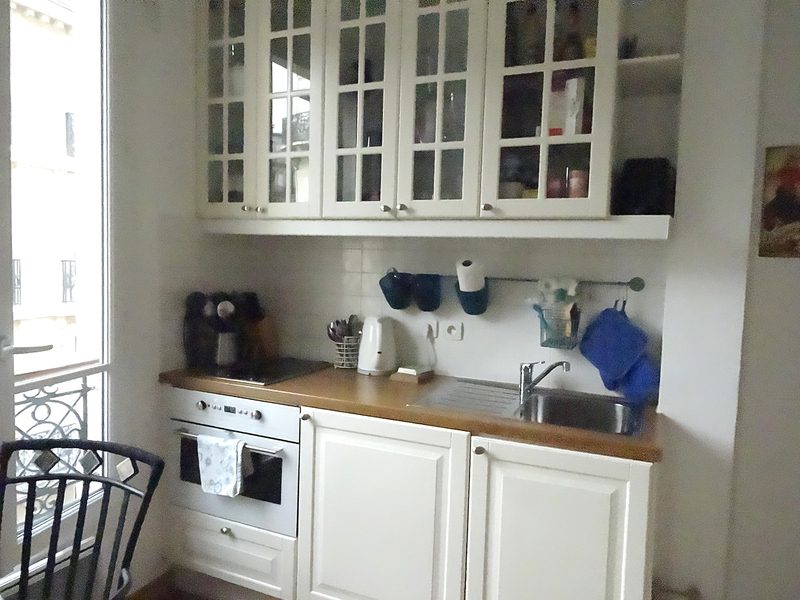 The location of the apartment is ideal: five minutes walk in either direction and you are in the Canal District, or Place de la Republique and all its train lines, or the swanky Haut Marais. A wonderful street market is just a block away, as is the Métro line that takes me to my own neglected apartment should I want to check on it. The district is young and lively, with bars, incredible restaurants like Pierre Sang, Chateaubriand, and Aux Deux Amis, as well as great shopping and convenience just outside my door. The energy, being in the center of it all—I’m loving it. The downside of all this convenience? Noise. Lots of it. 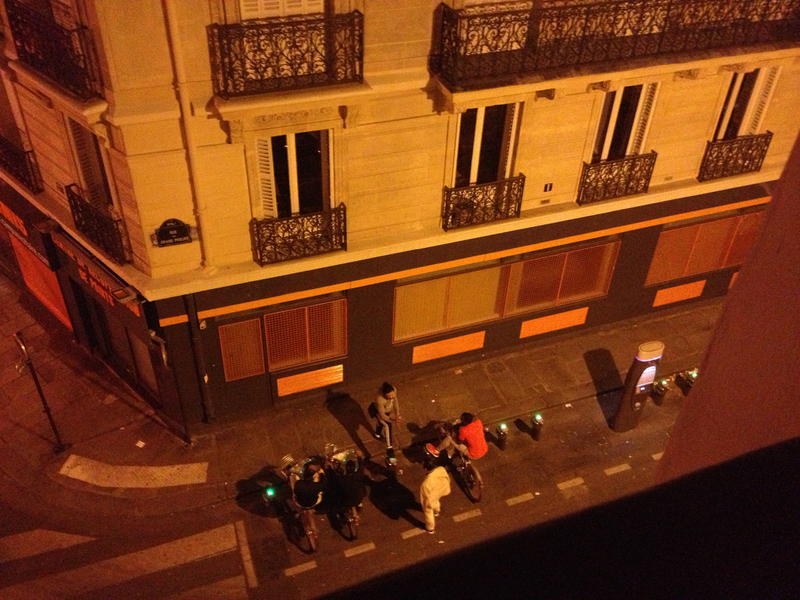 The apartment is surrounded by bars—across the avenue, around the corner. 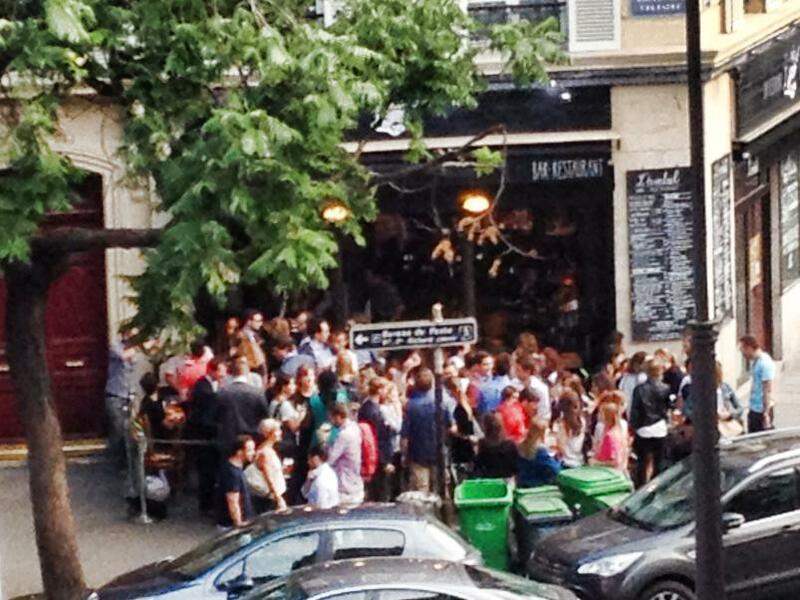 This being summer, they’re full of people gathering outside drinking and yakking it up, and the crowd tends to stick around long after the bar closes. Summer days are long here, and with the sun setting around 10pm, there are precious few hours of darkness for sleeping before the sun rises again. Let’s just say, I’m averaging about four good hours of sleep a night. “That apartment is killing you,” my friend Andrew said, seeing me for the first time upon his return from vacation. “Do I look tired?” I asked. Okay, so it’s not all swell in my new digs. In fact, with the noise level, it’s a lot like my apartment in New York, which is on 7th Avenue. 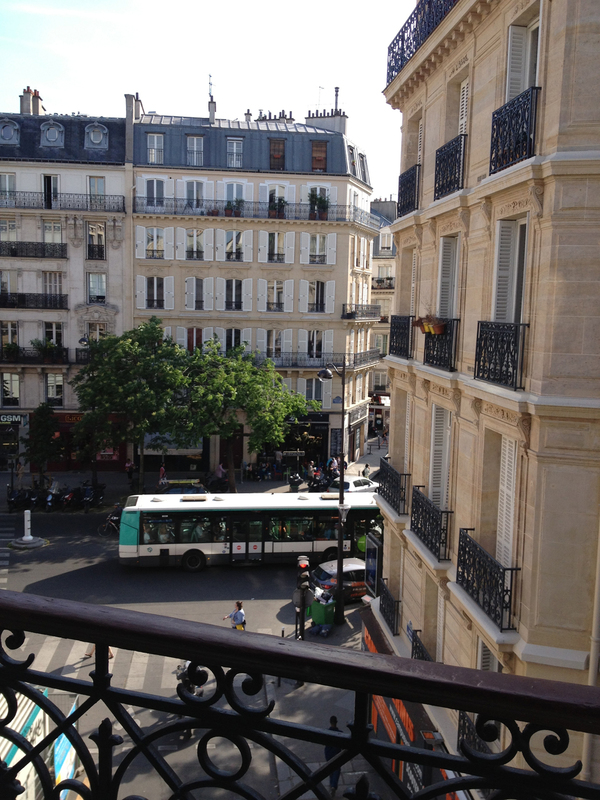 This apartment also faces a major boulevard, but I’m convinced Paris traffic is louder than NYC traffic. The reason, I believe, is because foreign engines seem to rev at a higher-pitched, almost whiney level. Add to this the buzzing scooters and rumbling motorcycles sans mufflers, and you have an ear-bleeding, hair-pulling combination. Now I’m the one who is high-pitched and whiney. Not all the noises are intrusive, though. Some are actually quite nice, like the tenor who lives in one of the nearby buildings. He practices every day, his shimmering voice filling the street. His most enthusiastic audience are the women who occupy an office in the building across the way, and me, a fellow opera singer. We lean out our windows listening, giving a thumbs-up when he hits a high note. “Not bad!” we call to each other from across the street, giggling. There are other sounds of daily life that can be heard over the din. The charming ding! ding! of the bell on the city bus, like a trolley car, as it approaches the stop. The tapping of my elderly neighbor’s cane when he takes his daily stroll down the street. The rhythmic clack-clackety-clack of the shop gate below me opening at 10am and closing down at 11:30pm. I’ve come to know these noises, to rely on them. They bond me to the neighborhood. 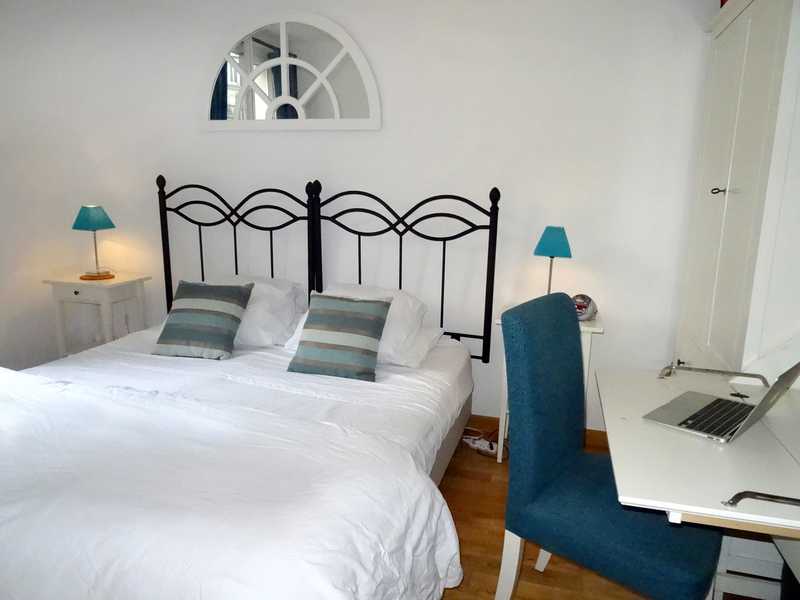 My first two apartments were bucolic by comparison, in one of the oldest parts of the city, nestled in 17th-century buildings on tiny, cobbled streets. And in those first two months, I’d forgotten I was in a big city, or at least what a big city sounds like. But here, in the center of it all, where the streets are wider and the buildings bigger, bright neon lights shine in my window at night, horns and sirens rattle me all day, and the madding crowd reminds me I’m in the heart of a thriving metropolis—and part of a larger community. Maybe it’s the Universe’s way of preparing me for my return to New York, easing me into big, loud city life. 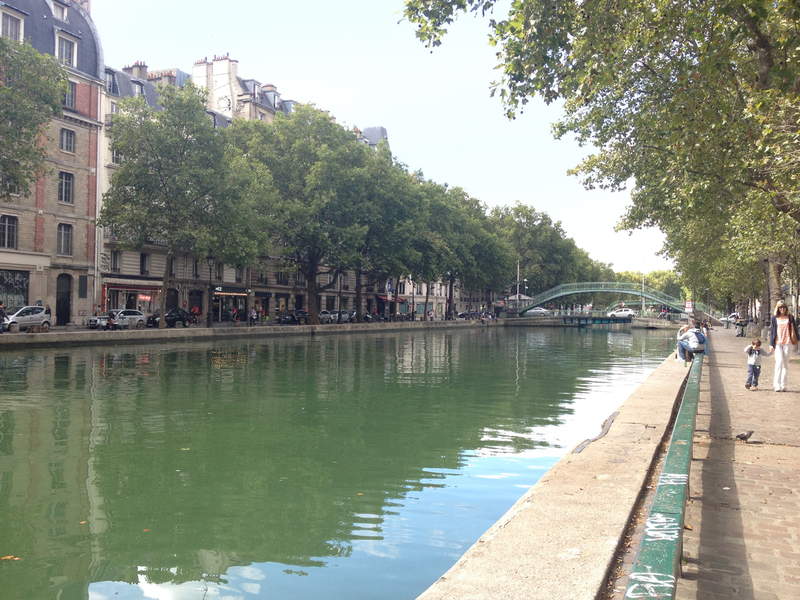 Canal St. Martin, just 5 minutes away. Another perk of the location of this apartment. I just LOVE this post and I love your adorable apart! I felt like I was strolling around with you ad you were giving me a very delightful guided tour of your place and neighbourhood. It was such a pleasure to read your account. .. and such wonderful and detailed descriptive narrative! Of course, it’s not MY apartment. I borrowed it. Moved on to a new one, the fourth. Post to come! LIsa, I love your posts and hope some day to have a tiny Paris apartment of my own. 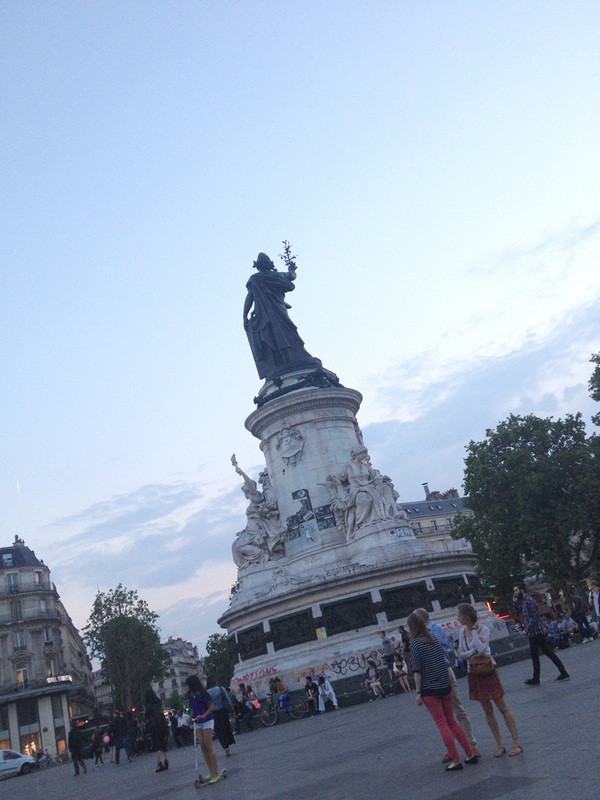 I have learned so much through you – you are my Paris guide! Thank you for all your candor. “Oberkampf”? Is that where the Germans lived between 1940-44? And don’t get me started on noise. I don’t know how you stand it. Come back to New York, dear friend!